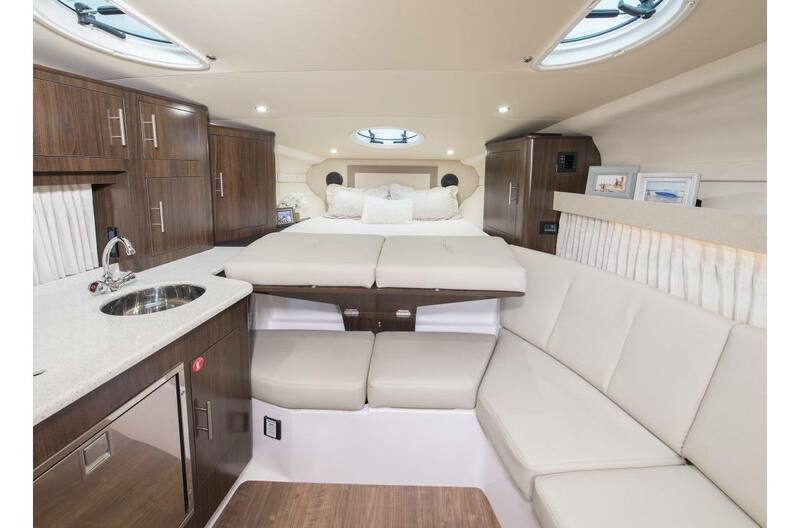 Massive Lazarette Storage: With this massive storage space, there's no need to be selective when packing for your perfect day on the water! 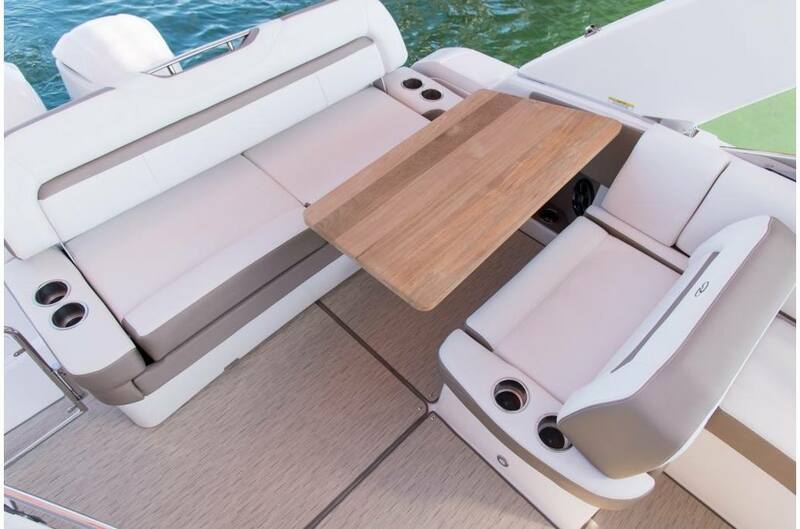 Face-to-Face Seating: Flip the Social Seat and comfortably accommodate five to enjoy spending time with those that love being on the water with you. 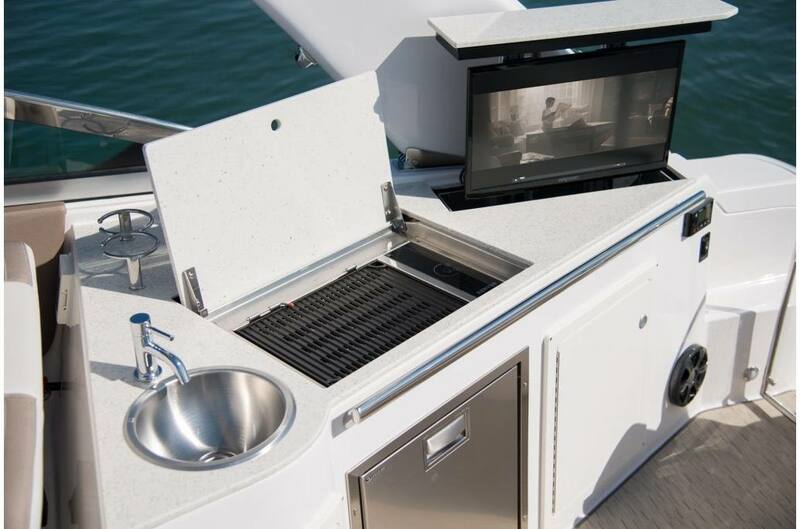 Wraparound Swim Platform: The low-to-the-water swim platform wraps around the outboards. Multi-Position Sunlounge: Lay the backrest down, get comfortable, and soak in the rays. 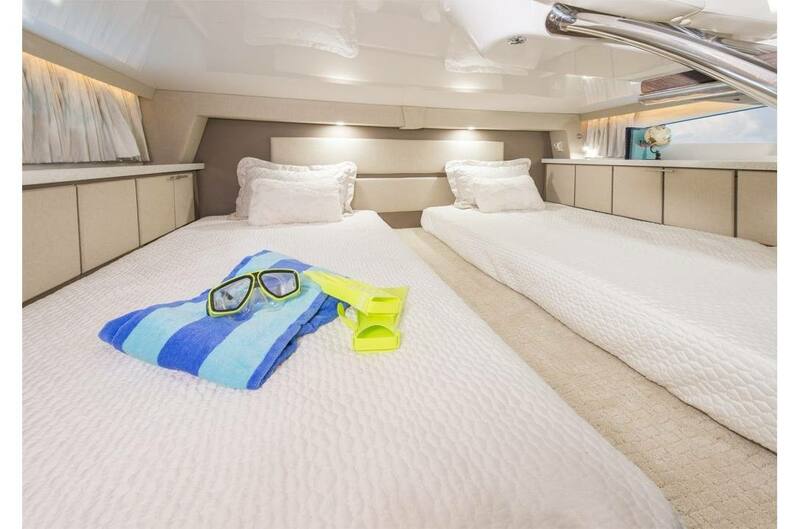 King Size Bed: The only boat in its class to feature a king size bed. Dual Dockside Power: Dual 30 amp dockside power connections and a 50 foot cord will keep everything powered. Convertible Twin Beds: Two over-sized twin berths that can zip together to form a king. Floor Locker: The floor locker is a perfect spot to store your larger items. 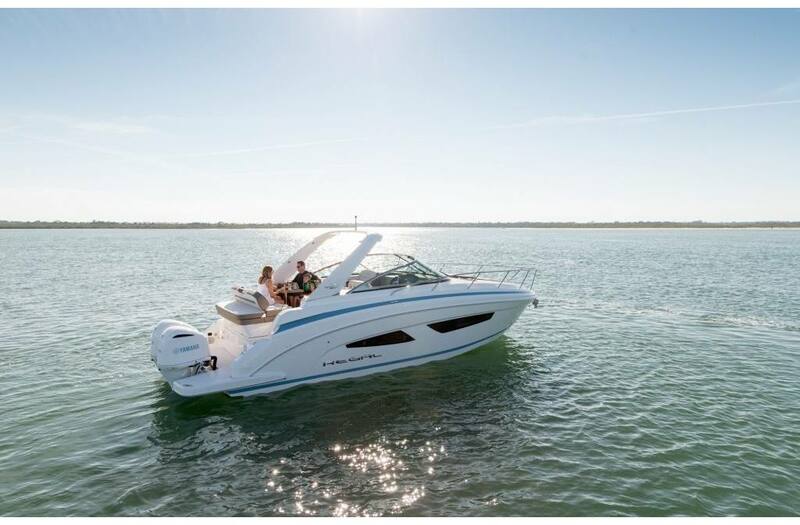 Fusion Marine Sound - 2 cabin speakers: Two 200 watt Fusion speakers make the cabin sound like a home theater. 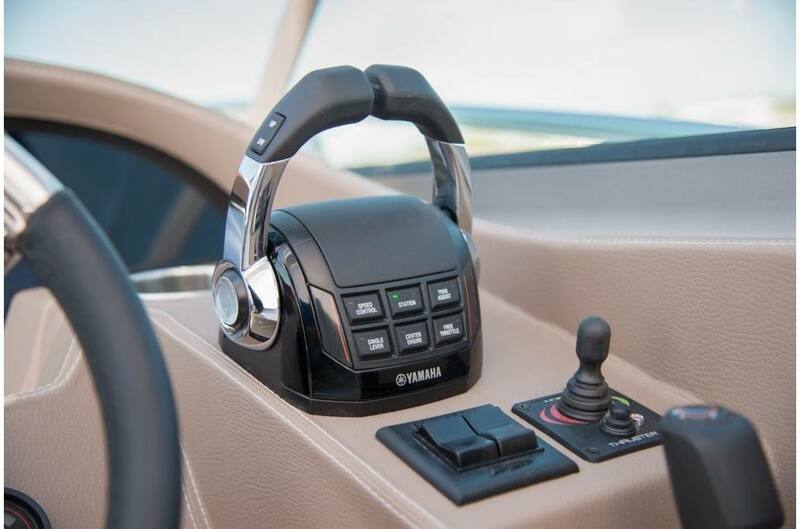 Fusion UD650 Marine Stereo: The Fusion radio has full integration for your smart phone, which can be enclosed in a waterproof uni-dock or connected via Bluetooth and has AM/FM/ radio capabilities. 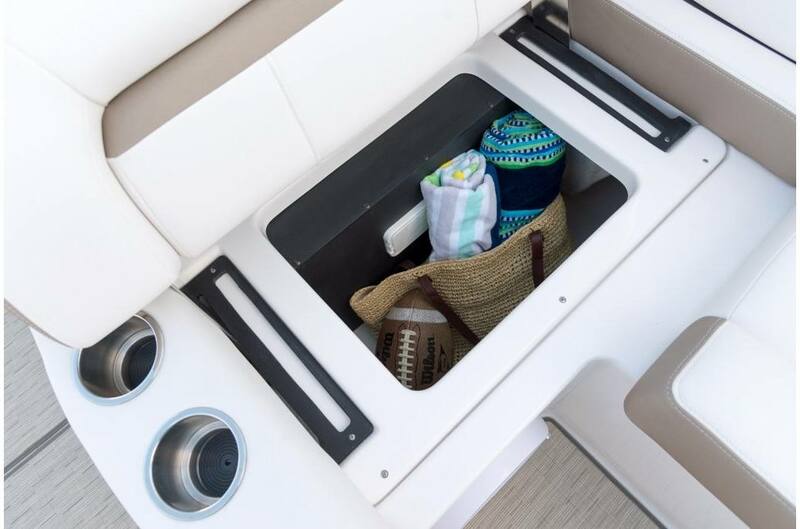 Convertible Forward Berth: The convertible forward berth is what you should expect from the most versatile boat in it's class. Hand Crafted Cabinetry: The cabinetry and drawers look stunning when entering the cabin. More stunning is the finish inside and out. Microwave: Regal galleys feature all the amenities you would come to expect, including a full-size microwave oven. 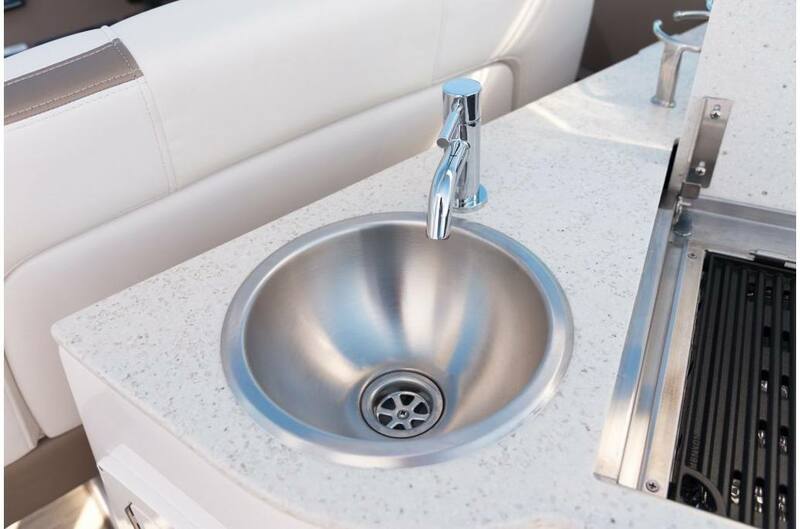 Separate Shower Head: Many cruisers feature a sink spigot that converts to a shower head, on this boat a separate shower head and sink faucet are standard. 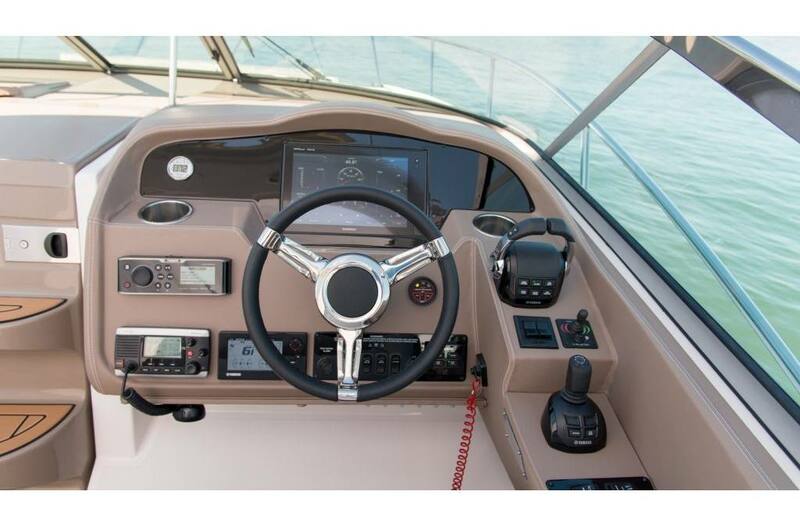 32" LED TV: Many yachts in this class feature small televisions, the Regal features a full sized 32" LED TV. 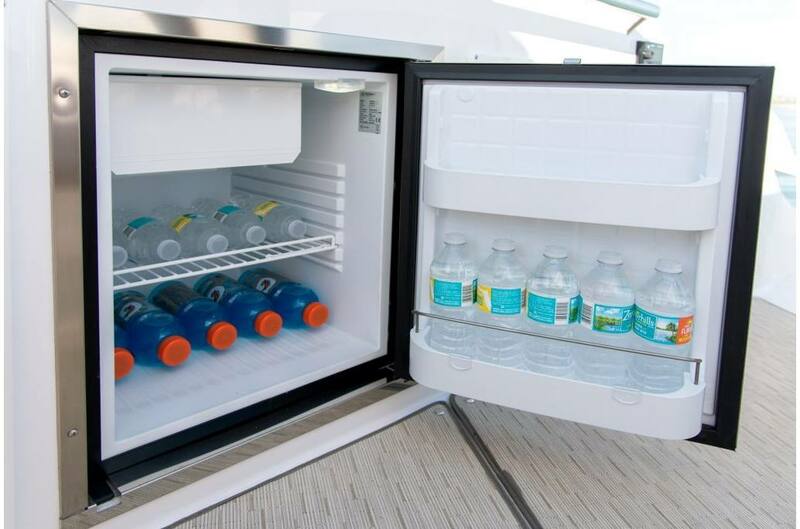 Refrigerator: A 4.2 cubic foot refrigerator will store more than enough for your next boating adventure. Single Level Cockpit Sole: No need to separate the guests, or the party. The single level cockpit sole keeps everyone on the same level and in view of the beautiful horizon. Refreshment Center: A full service refreshment center that has all the amenities easily within reach. Slide-Away Cockpit Seating: Extend the cockpit with just the push of a button. Teak Cockpit Table: Enjoy the luxury of a teak cockpit table. Hand-Wrapped Steering Wheel: The hand wrapped steering wheel reminds you why Regal was the right choice. 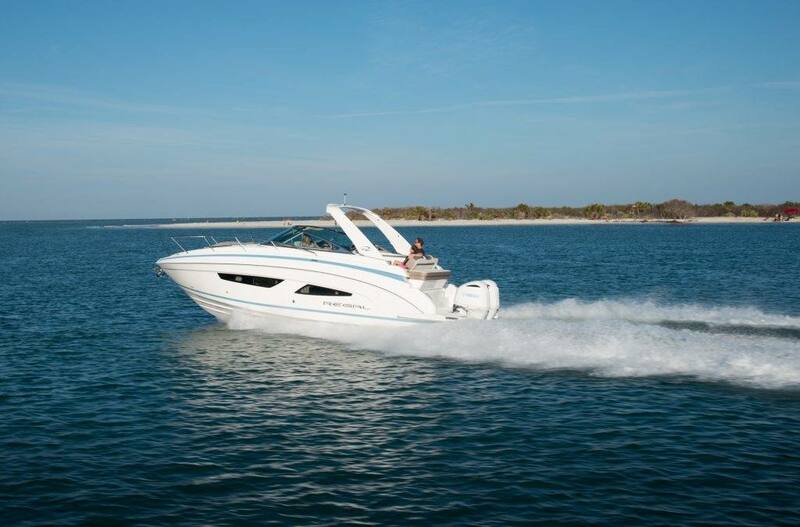 C. Raymond Hunt Hull: C. Raymond Hunt hulls have a reputation for providing the best ride in the industry. 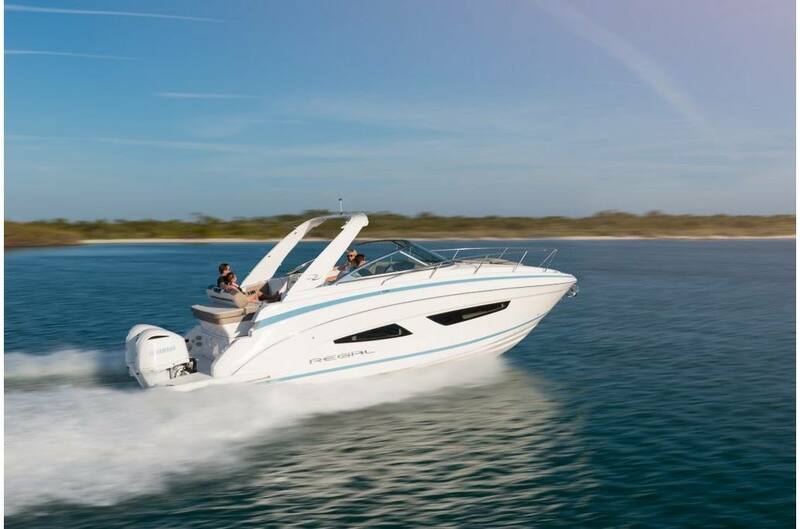 The 32 Express provides a soft, dry and stable experience that no other boat can match. Double Wide Helm Seat: A captain is not worth his salt without his mate by his side. Large Hull Side Windows: Large windows in the salon, galley, and on both sides of the mid-cabin provide an abundance of natural light. 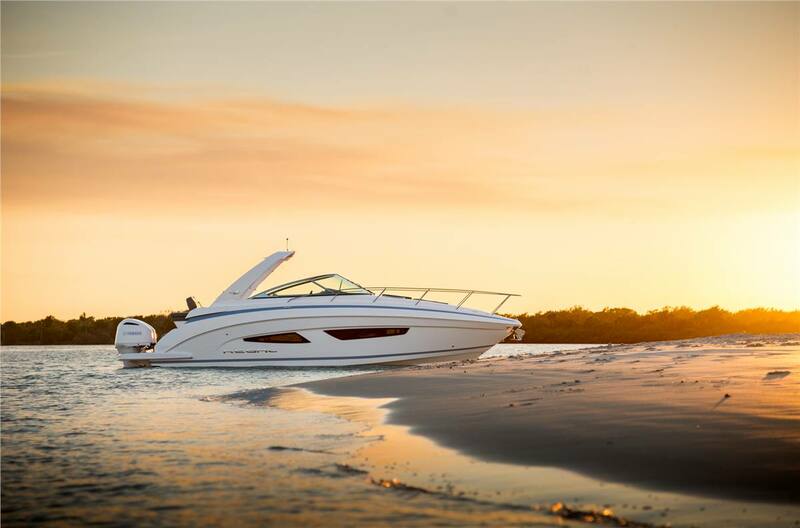 Navigation Lights: When it comes to boating at night, Regal has you covered with navigation lights standard. One Piece Bow Rail: The one piece and 316 grade stainless steel bow rail just reminds you why to buy the superior quality and finish of a Regal. Stainless Windshield Header: An anodized aluminum windshield header may be the industry norm, but Regal owners much prefer the standard stainless. Painted Engines - White - Elevate your style with white painted engines. Spotlight - Remote Control - Keep an eye on the path ahead with this remote controlled spotlight. Alcohol/Electric Stove - Not only can you enjoy the simplicity of our alcohol/electric stove, but this dual combination cooktop is also backed by electric cooking elements. 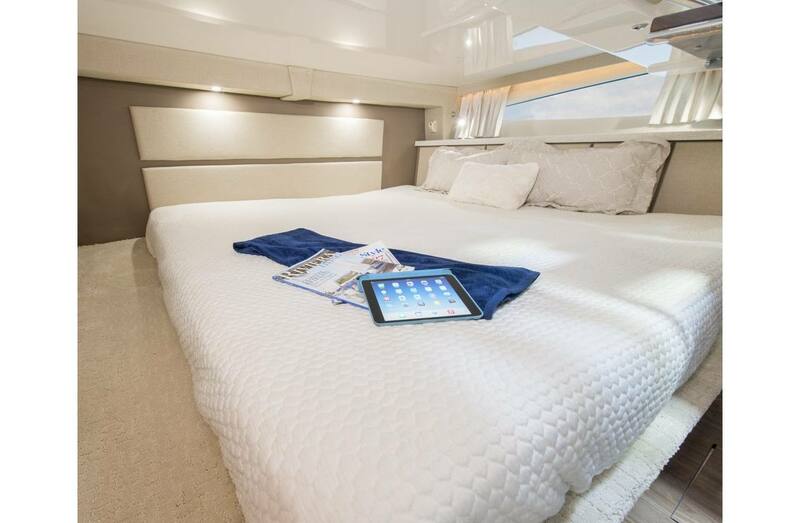 Convertible Salon Berth - The convertible salon berth is what you should expect from the most versatile boat in it's class. Innerspring Mattress - Don't sacrifice comfort and a good night's sleep just because you're on-board. 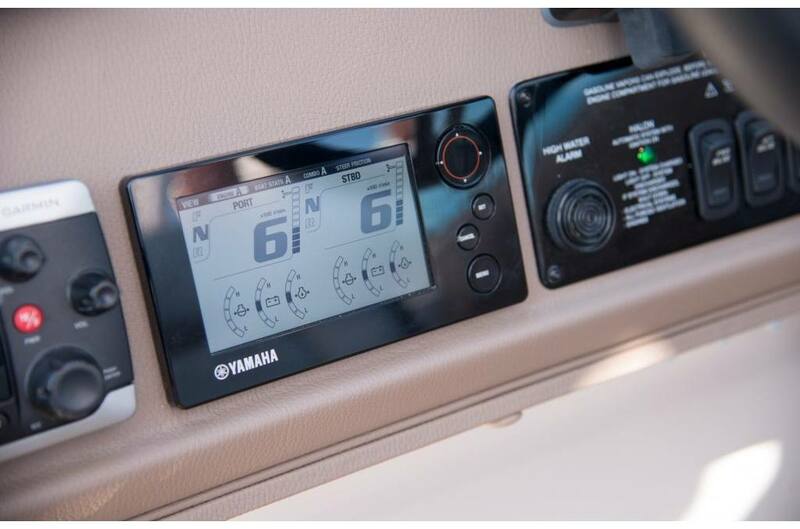 Cockpit Cover - The traditional snap on cockpit cover is perfect when you are keeping your boat in a boat house or floating slip. 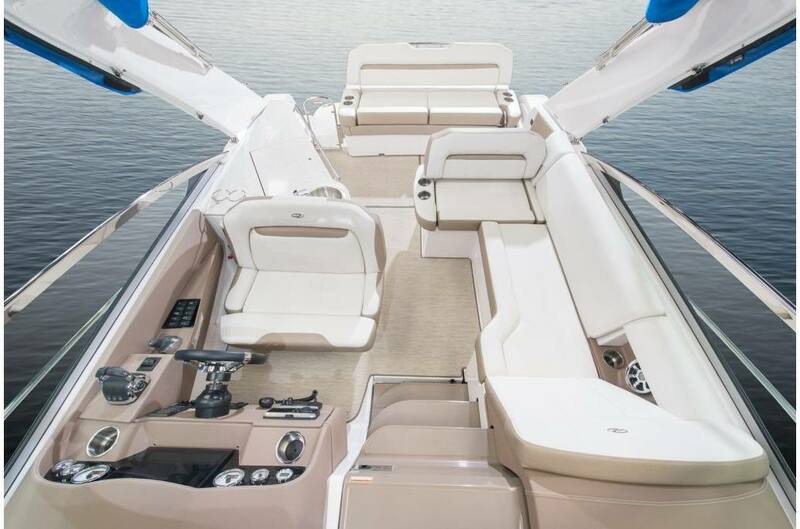 Gulf Coast White - Simple and elegant, gulf coast white with cream accents gives your upholstery a fresh, clean look. Anchor Windlass - all chain - Enjoy added durability when anchoring. 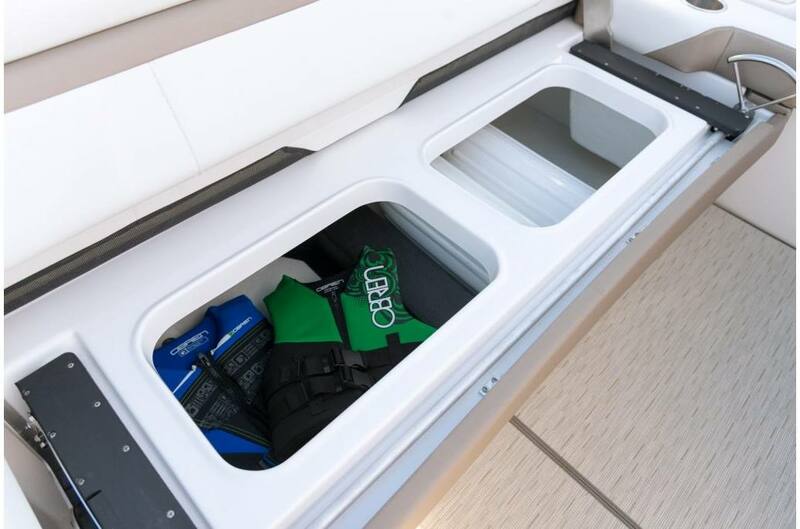 Swimplatform Cleats - Dual swim platform cleats makes it even easier to secure your boat and still maintain easy entry & exit access. 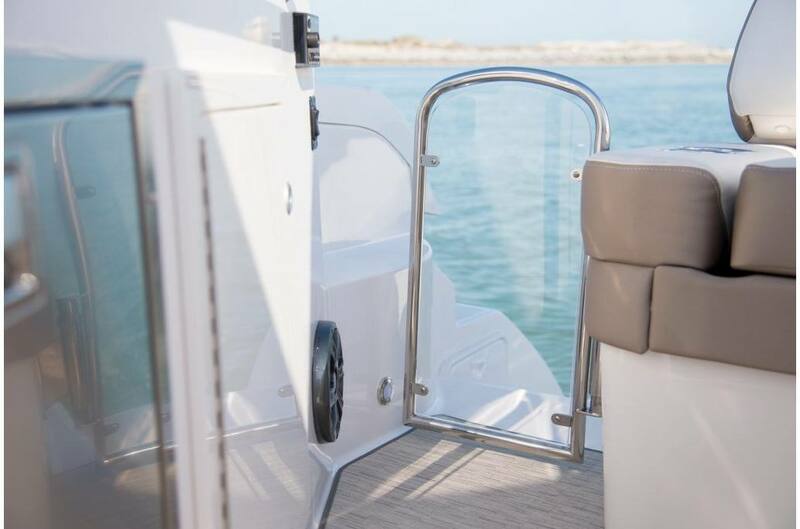 SeaDek Swim Platform - Teak - SeaDeck keeps your transom protected and gives a soft cushion for your feet. Easily cleans to look like new. Cockpit TV 22" - Raise the TV from within the counter with just the touch of a button to watch some football or your favorite show while enjoying the fresh air. 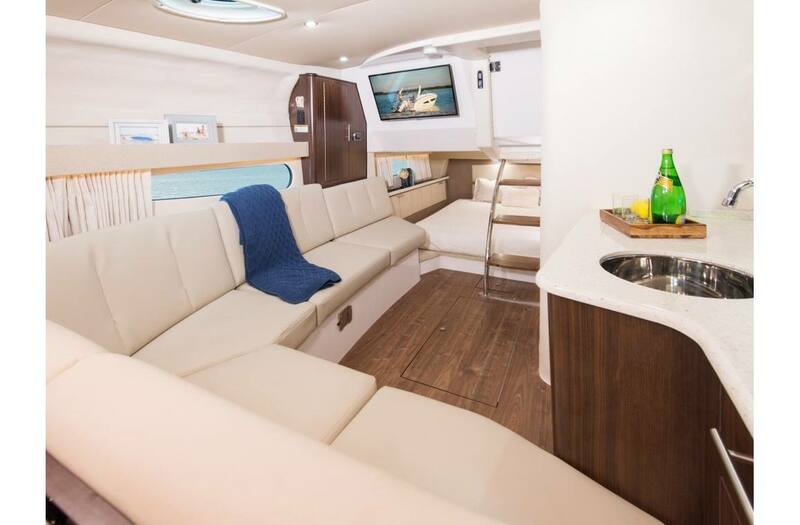 TV - Mid Cabin - All the comforts of home, while on the water. 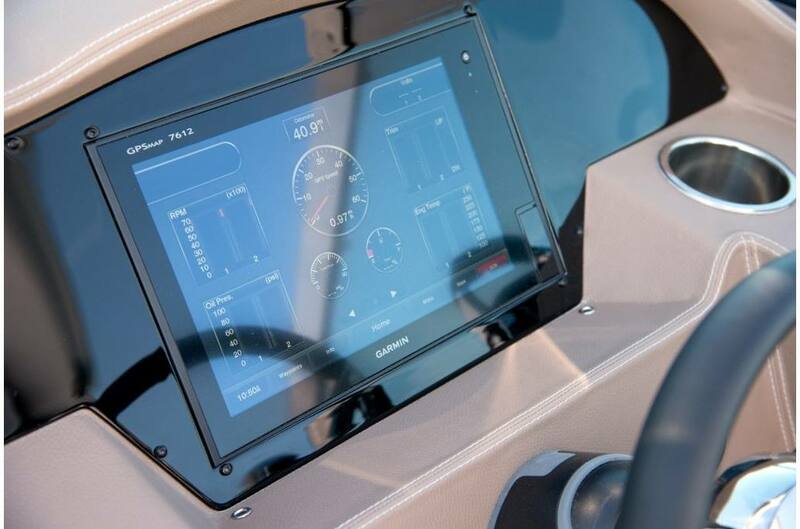 Garmin 100 VHF Radio - The Garmin VHF 100 marine receiver features intuitive design and provides radio communication to enhance convenience and safety to mariners worldwide. 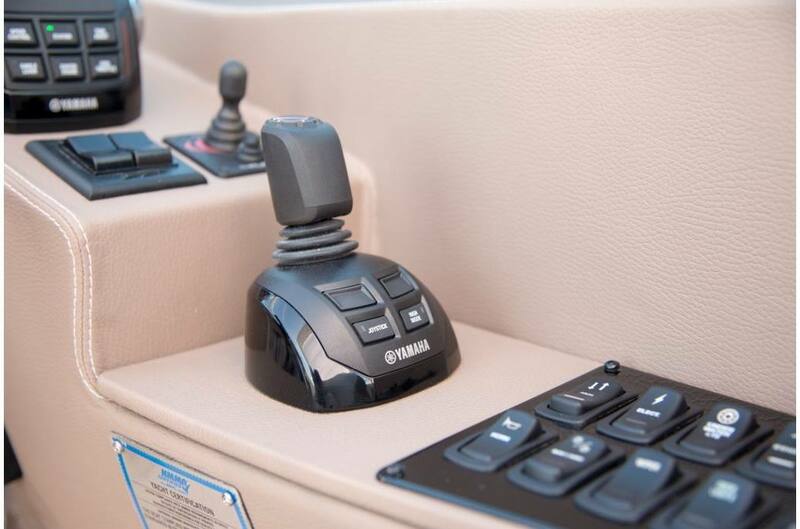 Garmin 7612xsv + B60 Transducer - Feel the freedom to explore new waters with the Garmin 7612xsv + B60 Transducer combination. Garmin Autopilot - Smooth cruising with advanced IPS autopilot. Garmin Closed Array Radar - The GMR 18 brings you the power of X-band digital marine radar scanning like never before.